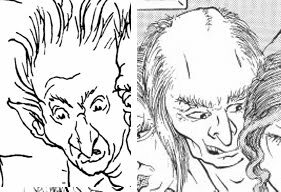 If you're even moderately familiar with the history of D&D Module B3: Palace of the Silver Princess, then you're no doubt aware of the two versions of the module, and the questionable artwork from the first version. While doing some digging/scouring yesterday for some public domain artwork, I came across the following Arthur Rackham illustration from the 1922/27 edition of Macmillan's English Fairy Tales. 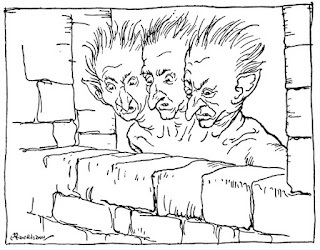 It's an illustration of the three-headed giant from the story Jack the Giant Killer and when I saw it, the first thing that popped in my head was Erol Otus's illustration of the ubues from B3. 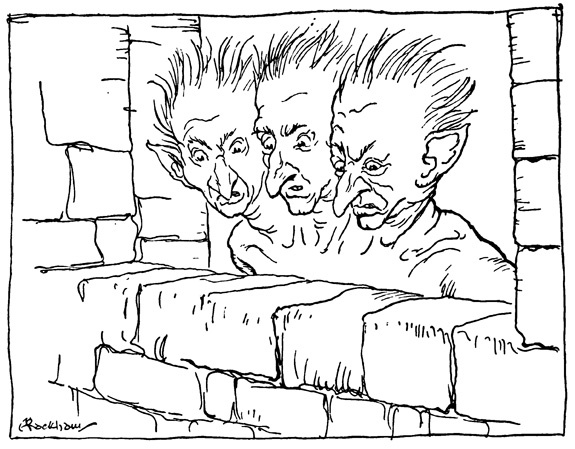 Was Erol influenced by the Rackham illustration? Probably. But if I actually make it out the North Texas RPG Con this year, I'm going to ask him for myself! Honestly folks, I had not planned on officially releasing this until Wednesday, but somehow my intended release date on RPGNow didn't "stick," so it's available now. This is the adventure I designed for William's Roman-themed adventure design contest at his Ramblings of a Great Khan blog. 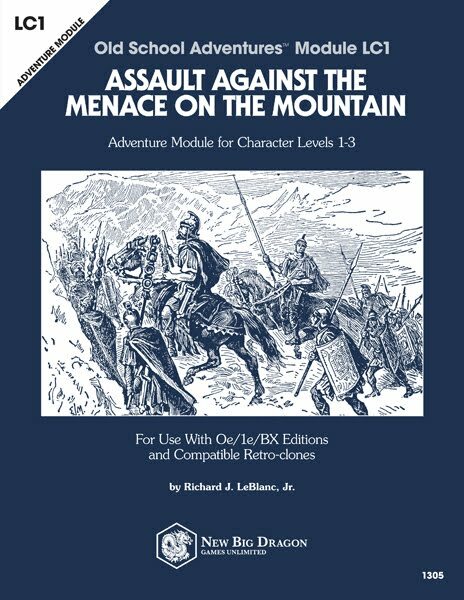 It started out as a much smaller thing, and before I knew it, I'd completed a 12-page "one-shot" module (similar in vibe to a tournament-style module). It's pulp-horror-style adventure based on a story by the master of pulp horror. It's designed for character levels 1-3; and designed to be used with 0e/1e/BX and compatible retro-clones. It is the Terrible Season of the autumn, and the wild people in the mountains are preparing for the frightful ceremonies which only rumour tells of in the towns. One seldom sees these wild people from the mountain; but a few times a year they send down little yellow, squint-eyed messengers to trade with the merchants by means of gestures, and every spring and autumn they hold the infamous rites on the peaks, their howlings and altar-fires throwing terror into the villages. Always the same—the night before the Kalends of Maius and the night before the Kalends of November. Townsfolk disappear just before these nights, and are never heard of again. This year the dread is even greater, for the people know that the wrath of the very old folk is due upon the town of Pompelo. Three months ago, five of the little squint-eyed traders had come down from the hills, and in a market brawl three of them had been killed. The remaining two had gone back wordlessly to their mountains—and this autumn not a single villager has disappeared yet. There is menace in this immunity, for it is not like the very old folk to spare their victims at the Sabbath. It is too good to be normal, and the villagers are afraid. A cohort has been assembled to end this menace once and for all, and there is always room for more heroes. 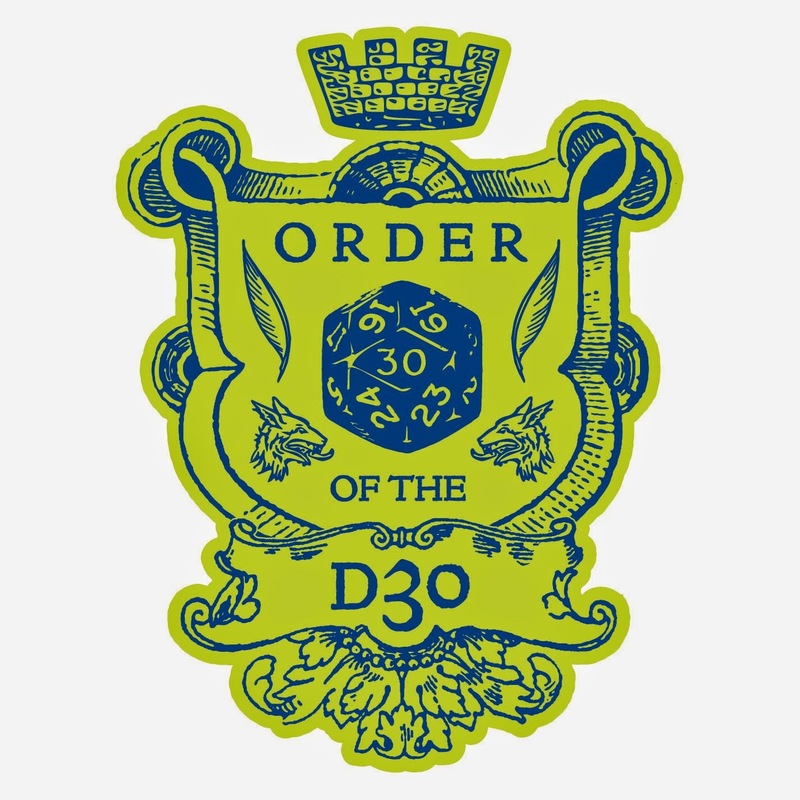 Today is a bonus edition of the d30 Feature of the Week, and is Part II of yesterday's Part I post of my d30-based Adventure Seed Generator. As I mentioned yesterday, this was something I felt like was missing from the d30 Sandbox Companion, but is now slated as one of the lead-off items. I KNOW THEY LOOK A LOT A LIKE, BUT EACH PAGE (PAGE I AND PAGE II) HAVE DIFFERENT TABLES. THIS IS THE SECOND PART OF A 2-PAGE GENERATOR!!! Again, if you need an excuse to use them, try creating something for William's Roman-themed adventure design contest over at his Ramblings of a Great Khan blog! And maybe you'll win a copy of one of the book's that inspired Tolkien. 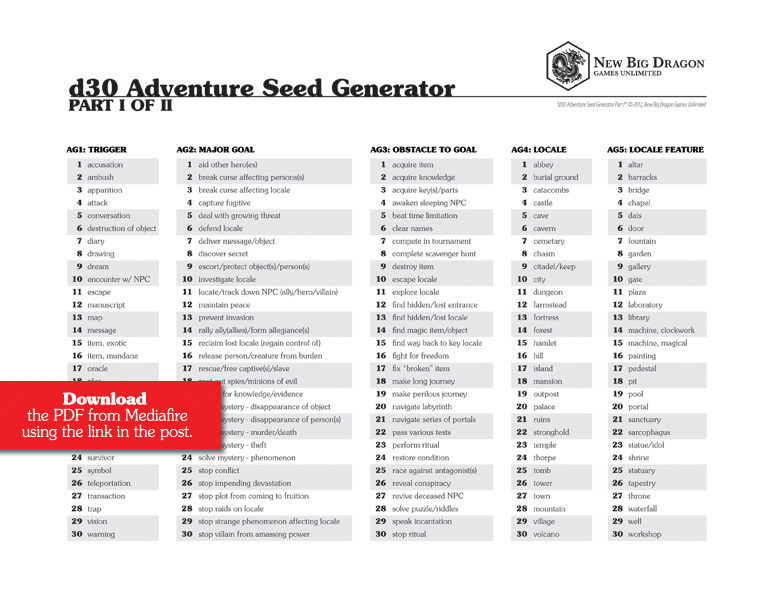 d30 Adventure Seed Generator from MediaFire. As I worked on it, I realized it it needed two pages. And guess how many "blank" pages I had left in the book. Yup! TWO! 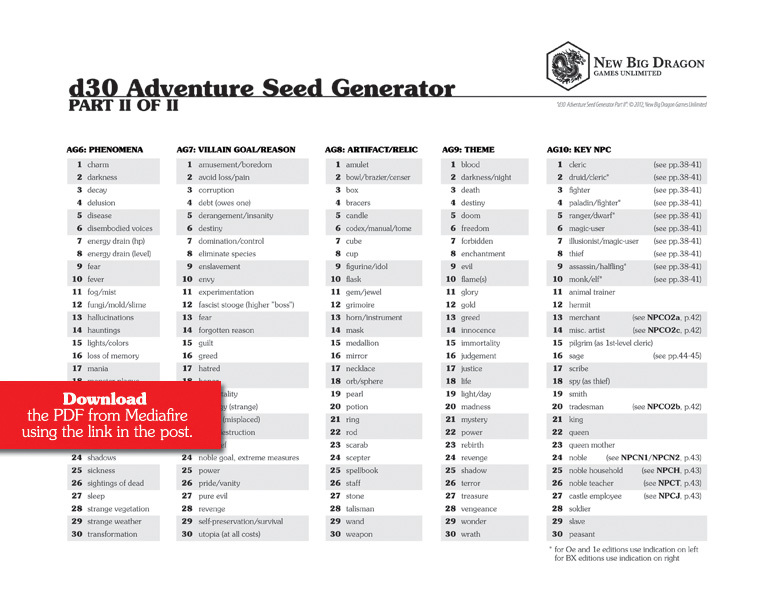 So today, I present Part I of the Adventure Seed Generator. Part II will be coming tomorrow, so be on the lookout. 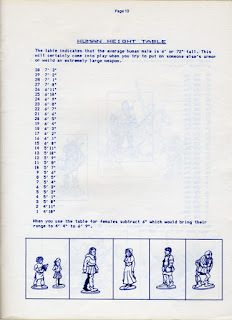 (Part II includes tables for: phenomena, villain goal/reason, artifact/relic, theme, and key NPC). BTW, if you need an excuse to use them, try creating something for William's Roman-themed adventure design contest over at his Ramblings of a Great Khan blog! And maybe you'll win a copy of one of the book's that inspired Tolkien. 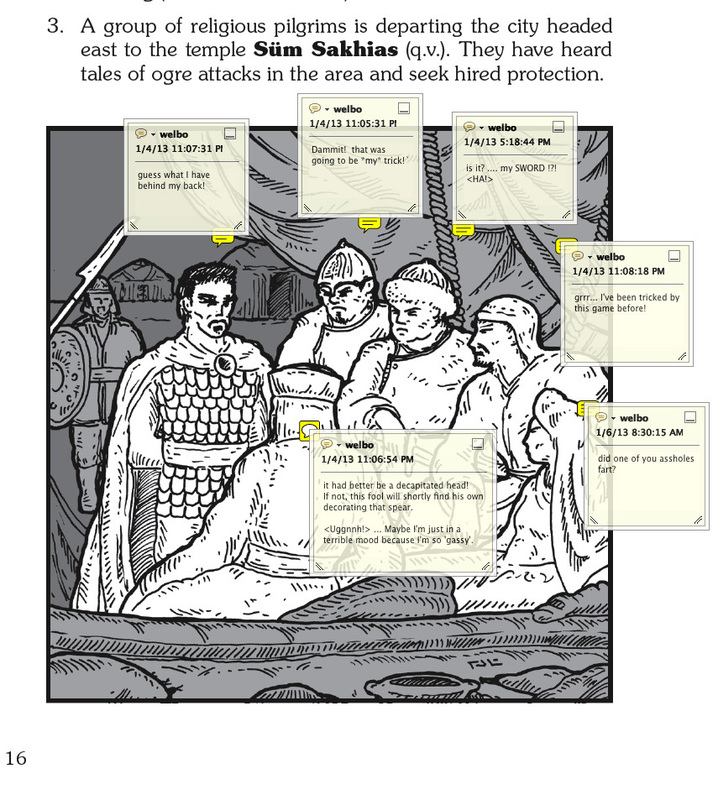 I know I mentioned in Monday's post about Roman-themed adventure design ideas that today's post would be yesterday's post, but yesterday's post was precluded by my announcement of my prize contribution to William's Roman-themed adventure design contest at his Ramblings of a Great Khan blog. 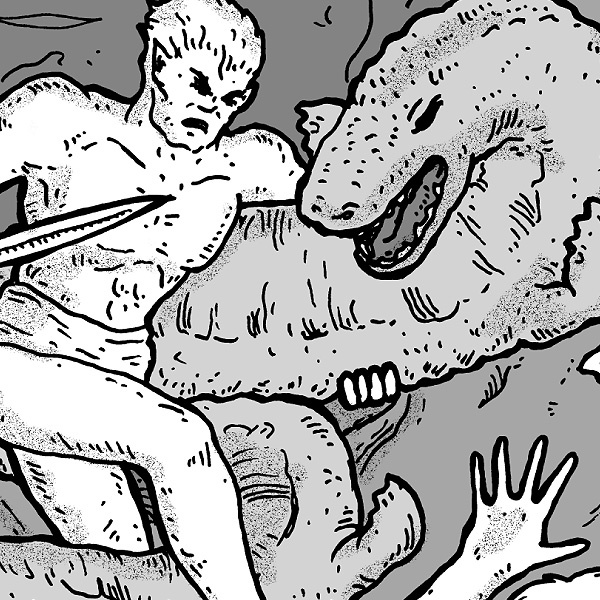 Today's Monster of the Week entry is actually one that's been slated for inclusion in the Creature Compendium for quite a while. The fact that it's Roman in origin is just serendipitous. Though bandits by nature, cacuses fancy themselves as shepherds, raising sheep both for their wool and their meat. When encountered in their lair, there is a 75% chance there will be a herd of 10-40 sheep nearby. If there are 6 or more cacuses are present in their lair, there is a 50% chance that one of them will be female. If there are 7 present, 1 of them will be female. If 8 are present, there will be at least one female, and there is a 50% chance there will be an additional female. I've written before on this blog about William Morris, and how the industrial revolution inspired the original fantasy game, and I pointed you (at the bottom of that post) toward a couple of online editions of his books. One of the books I didn't mention at the time was The House of the Wolfings. And now's the perfect time for me to do just that. Warriors, dwarves, gods, epic battles, magic armor, and a ring. If this all sounds a familiar, it’s for good reason. In The House of the Wolfings, the first of the author’s many great fantastic romances, William Morris weaves the traditional with the supernatural, and establishes a precursor to the modern epic fantasy genre. 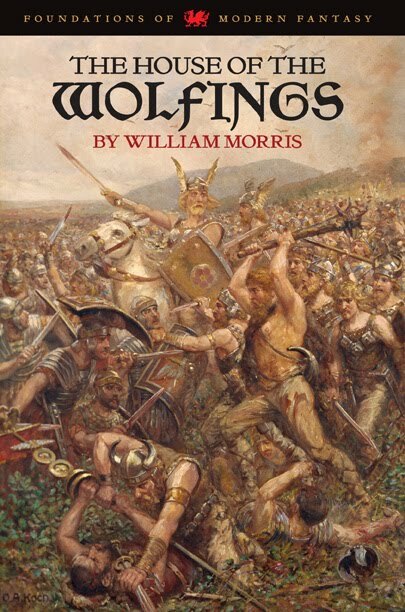 Based on a translation of an old Norse saga, Morris reconstructs a portrait of the lives of the Germanic Gothic Tribes galvanized into action againts the attacks of imperial Rome. Thiodolf, the leader of the Wolfings, is one of two men chosen as War-Dukes to lead the tribes against their enemies. Thiodolf may be supported by his lover the Wood-Sun and their daughter the Hall-Sun (both of whom are related to the gods), but he also possesses a dwarf-made mail-shirt that, unbeknownst to him, bears a curse. Based on two different editions of the book (both over 100 years old), I've taken the text (which resides in the public domain) and put together an edition of the book perfect for the gamer's bookshelf (and at a better price than almost any other current print edition I've seen around). SO WHAT'S THIS YOU SAY ABOUT A FREE COPY? Well, William over at Ramblings of a Great Khan is doing a Roman-themed adventure design contest. 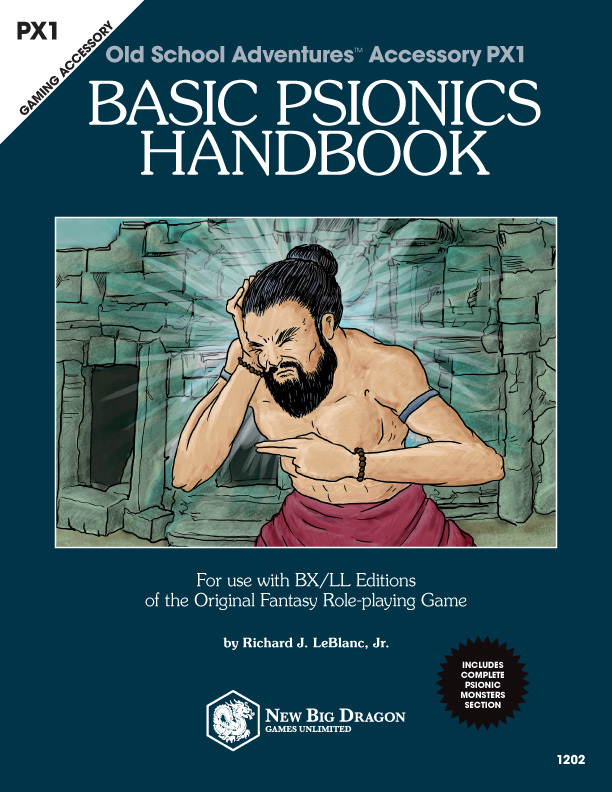 And given the theme of the contest, and the subject of Morris's book, it seemed like the perfect prize for me to donate to the cause (in addition to all the other cool prizes William already has lined up, like PDF copies of the 43 AD RPG, roman numeral dice, and custom illustrations courtesy of his wife). But you've got to hurry, because the contest deadline is the end of this month. William over at the Ramblings of a Great Khan blog has been running a Roman-themed adventure design contest that began back on the feast of Saturnalia, with the deadline being the end of this month. 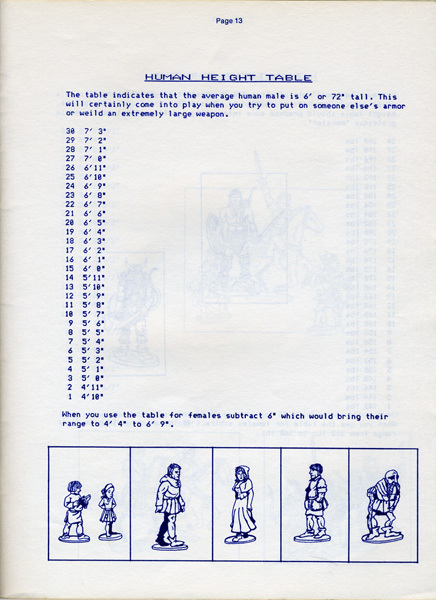 The prizes are pretty cool and are worth entering something just for the chance of winning, even if you're not sure how worthy your entry may be, and include: dice with Roman numerals, and PDF copies of the 43 AD rpg and its Warband supplement. It took a while for me to get my head wrapped around this one, but I kept my focus and plowed through it over the weekend, and finished my entry (ended up being 12 pages; details to come; I have not submitted it yet because I need to do another read-through). I do also have ideas for a couple of one-pager adventures and, time-permitting, will take a crack at those. William has mentioned entries are slow in coming. I know many are busy with other things, but it also struck me that entries to the contest might be slow because people may not be sure what to do in the Roman setting. It is for that reason I thought I'd throw some things out to get your juices flowing, and let you know you still have 10 days to get something together. Augur: Religious official who observes natural signs, esp. the behavior of birds, interpreting these as an indication of divine approval or disapproval of a proposed action. Flamen: A priest serving a particular deity (1 of 15 major deities). The fifteen Republican flamens are part of the Pontificial College which administer state-sponsored religion. 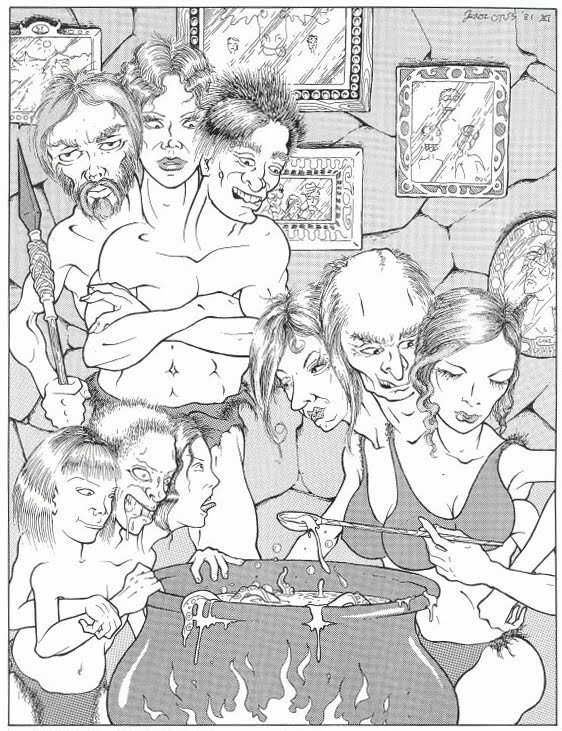 Haruspex: A person trained to practice a form of divination called haruspicy, hepatoscopy or hepatomancy. Haruspicy is the inspection of the entrails of sacrificed animals, especially the livers of sacrificed sheep and poultry. The rites were paralleled by other rites of divination such as the interpretation of lightning strikes, of the flight of birds (augury, auspicy), and of other natural omens. Haruspex: A senatorial priesthood reserved for patricians. 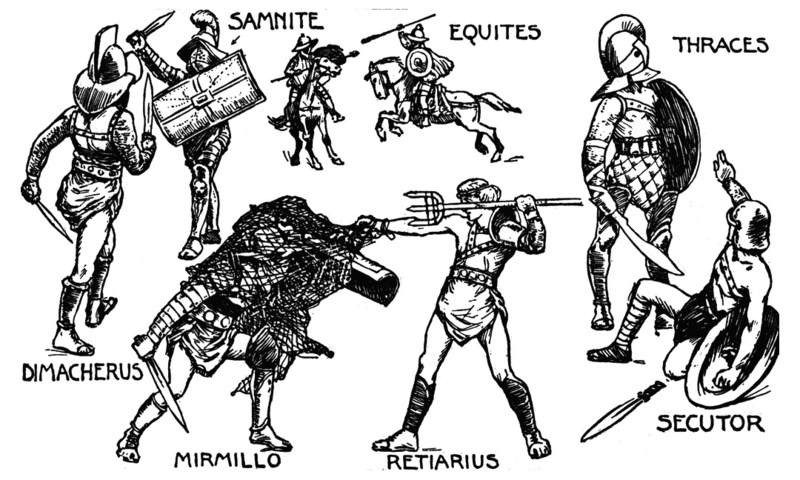 Praetorian Guard: Household troops/bodyguards of the Roman emperors. Lictor: An officer attending the consul or other magistrate. Legionarie: A soldier in a Roman legion. The great thing about the Romans is that they stole A LOT from the Greeks (beyond their alphabet), and that includes their mythology. So any of the following are common to the milieu: chimera, dryads, griffons, elementals, centaurs, harpies, medusas, nymphs, pegasi, satyrs, strigae, titans, and unicorns. There were also daemons, that were really just invisible creatures; you could adjust the stats for the invisible stalker for that one. 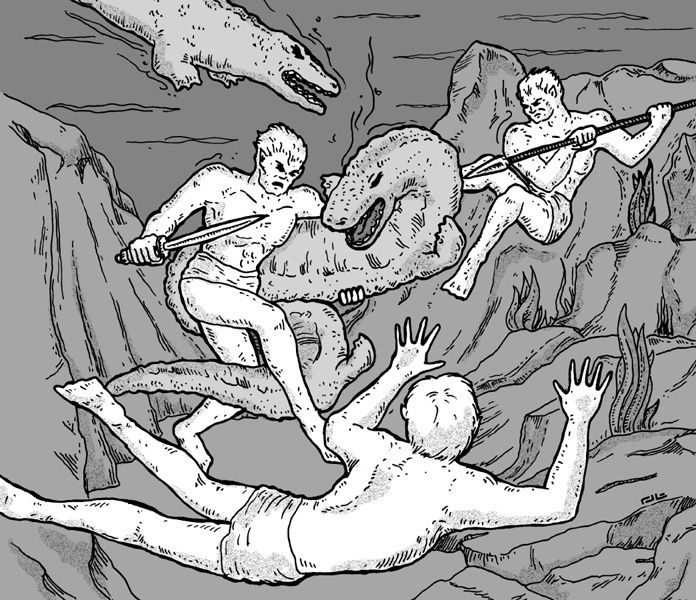 And then there are cacuses, a race of fire-breathing giants, which I will post as a new monster tomorrow. 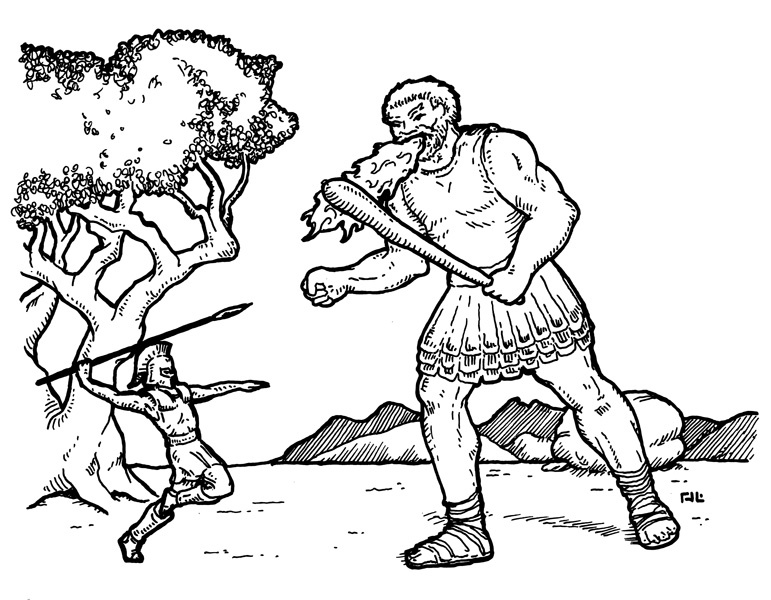 Also, if you had to, you could get away with the inclusion of cyclops, hydras, and minotaurs. And now some of other thoughts to start combining with the above. While doing some Lovecraft research this week, I stumbled across this article he authored on literary composition in The United Amateur. It's a very good "go to" piece for all of us that fancy ourselves writers. 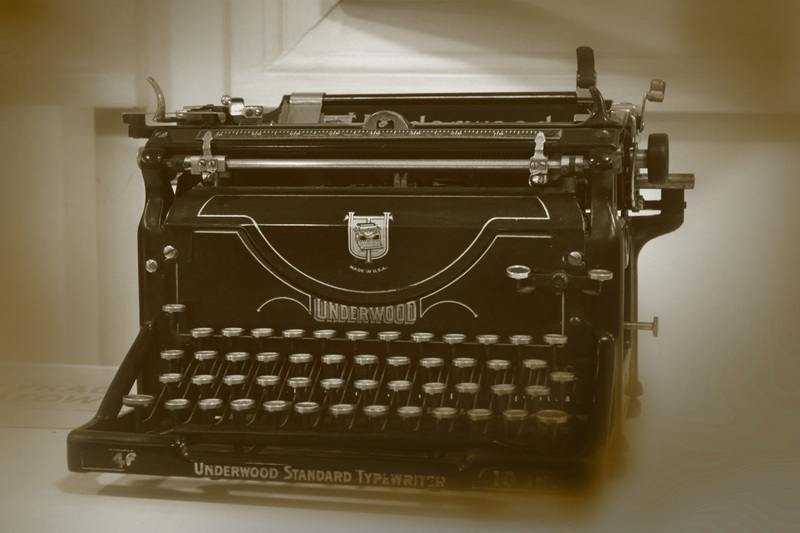 Want the whole collection Writings in the United Amateur by H. P. Lovecraft? Download it from Gutenberg.org. "and every spring, each new generation provides the makings of a delicious soup of fresh testicles"
When it comes to the d30 Companions, one of the things Welbo and I try to take great concern with is avoiding the fluff. For example, here's one of the pages that we had in a previous internal version that you WON'T see in the final d30 Sandbox Companion. Because we talked about it, and it felt like space-filler. 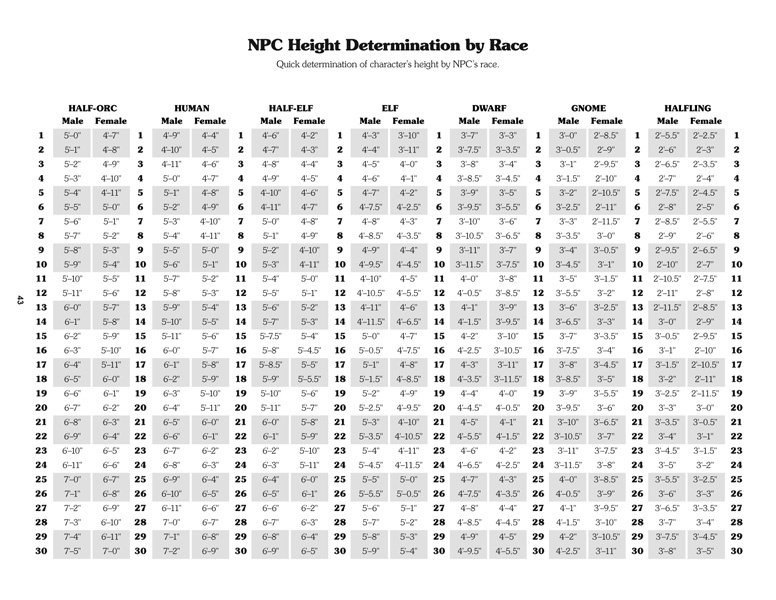 In addition to this waste of space (at left), there are additional PAGES for dwarf, elf, gnome, and "hobbit" height. That's 5 pages out of 40 dedicated solely to the height of characters. Wow! THAT'S fluff. It's obvious that the book was meant to capitalize on a polyhedral novelty. But that's not my goal. My goal is USEFUL stuff for the DM, aided by the use of the d30. The book should be the reason to own/use a d30, and not the other way around. That means trimming fluff like the height charts, and adding useful stuff like additional encounter charts by terrain type. So most of the fat has been trimmed, and we're making sure the rest of the book is as meaty as possible. More updates to follow SOON! 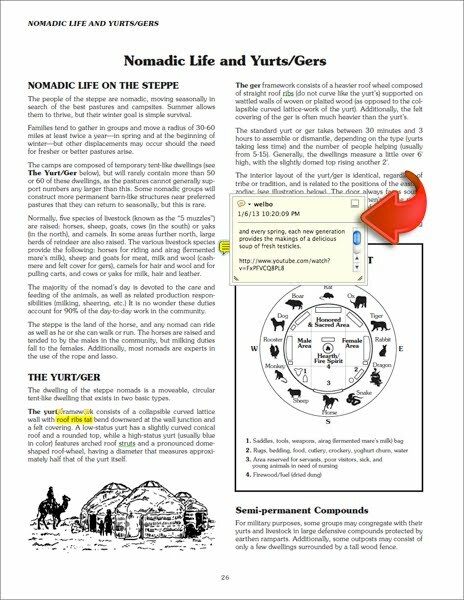 In addition to the really insightful notes I'm getting from Welbo on the Valley of the Five Fires regarding clarification, phrasing, and adding color, I get PDF notes like the ones on the image below. Many of you may have noticed how "thin" my blog posts have been over the past few weeks. 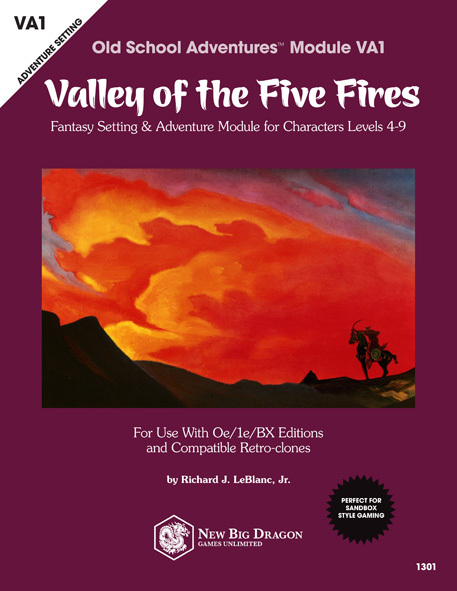 Well, in addition to the holidays, and trying to put the finishing touches on the d30 Sandbox Companion, the majority of my time has been consumed with what is now officially Old-School Adventures™ Module VA1: Valley of the Five Fires. 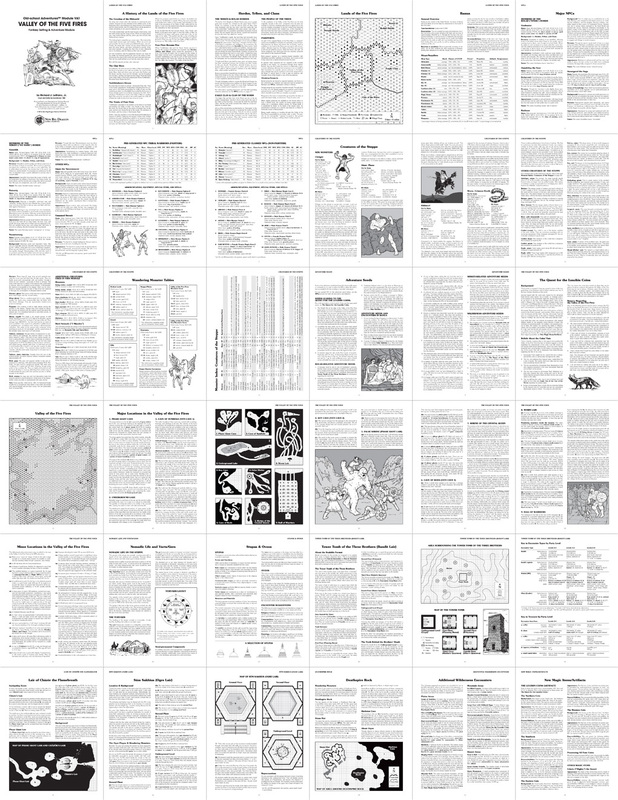 Since I have a bit more proofing/editing to do (hope to finish up over the weekend), and still need to order a test Lulu print to check the cover color, today I'm just going to tease you with a full preview of the inside of the 36 pages of the book, with complete details on the contents to come next week.